Note: this class is held at Marc Adams School of Woodworking. Registration links will be posted to this site once they become available. This class will cover all fundamental aspects of spalting, from fungal growth and culture transfer, to how fungi affect wood, to the modern science of fungal pigments and their uses. Students will learn how to pair the right fungi with the right wood to get the best results and minimize rot, and how to skip the inoculation steps altogether if desired. 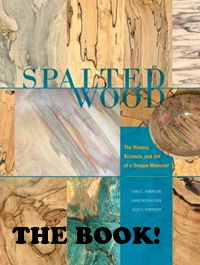 Anyone interested in the science and art history behind spalted wood, whether as classic woodwork or modern woodturning, will be well suited for the course.